Does this Spoon make your food taste better? This spoon is the Goûte, it is the result of studies “in search of the perfect spoon”. It is to replicate action of dipping it and licking your fingers. The Goûte, is an interesting piece of flatware made in both glass and wood. It was created by Andreas Fabian, a professor at Bucks New University who has a PhD in Spoons and Spoonness (honestly, that is what it says). He is working with chef Charles Michel. Modelled after the finger, Goûte is a teardrop-shaped glass wand designed to eat creamy foods like peanut butter, Nutella, yogurt, or chocolate mousse. 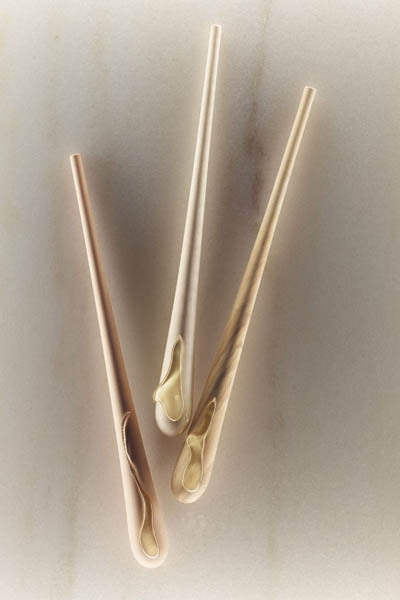 This hand-crafted utensil enhances creaminess and sweetness perception, heightens the value of food and makes for a more mindful eating experience. Cunning cutlery design or silly stick? You decide.